We can do it - Let us help you! We specialize in repairing commercial kitchen equipment like mixers, griddles, ovens, ranges, hot wells, proofers, steamers, dough rollers, pizza ovens, espresso and margarita machines. We rent, sell and repair dish machines and provide chemicals for them. 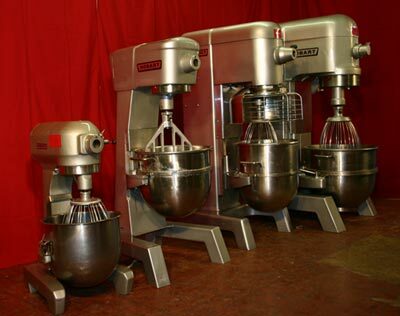 Featured Items: Hobart A-200 20qt Mixers and Hobart D-300 30qt Mixers. We sell and install new and used stainless tables and other counter necessities. We provide scheduled water filter and refridgeration gasket replacement. We repair laundry equipment as well as basic restaurant fixes like ceiling tiles, light fixtures and door hinges. We offer a complete line of parts for all of the equipment we sell and rent. Our staff has over 100 combined years of experience in the Food Equipment industry - Call us now at (361) 851-1002 or (800) 548-9257.